Arriving home from our winter odyssey earlier this month, we attacked our spring chores with a vengence, in anticipation of a departure in three weeks for another month of camping before the summer hoards descend on our favorite campgrounds. As it turns out, we needn’t have rushed to work. One of the items on the ‘to do’ list was to get the Fireball into a shop to get the brakes and bearings checked out one more time. Since our Louisiana tow/repair debacle, we’ve never been quite confident that everything is A-ok in that department. The earliest appointment we could get was April 20. John purchased a new jack to replace the one damaged in the tow (STILL waiting for AAA to respond), and left the Fireball with the service department, telling them our sorry story. Two hours later, they dropped the hammer on us – Fireball ain’t goin’ nowhere. The axle is severely damaged, and needs to be replaced. The service technician told John he was amazed we drove home from Louisiana without incident. Something about the spindle being damaged, yadayada. At that point, I could hear John’s voice on the phone, but all that registered was, “I’m sorry, Babe, but we can’t go to the Blue Ridge Rally” (a camping extravaganza with 70 other T@Bs and T@DAs in the Smokies). Axles are all custom-made, and take three weeks. Any way we can go pick up the part and still hit the road? Nope. Any way we can still make the trip? Nope!! We can only surmise that the service guys in Louisiana didn’t recognize the severity of the damage to the axle in our bearing blowout. Either that, or they just patched us up to get us the hell out of there. The place to which we had been towed, on Sunday naturally (do these things ever happen on a weekend when someone is around to answer questions? ), was a semi-trailer repair shop. Yet, that was where the AAA dispatcher told our tow truck to take us. At this point, it’s water over the dam. We did get home safely. Don’t want to overdramatize, but I’m in a black funk. We were really looking forward to this trip. But, we did get the estate sale for John’s folks’ house done. Lots of work to sell off a lifetime of possessions. They love their new home in a senior independent-living apartment, and that made things easier for everyone. 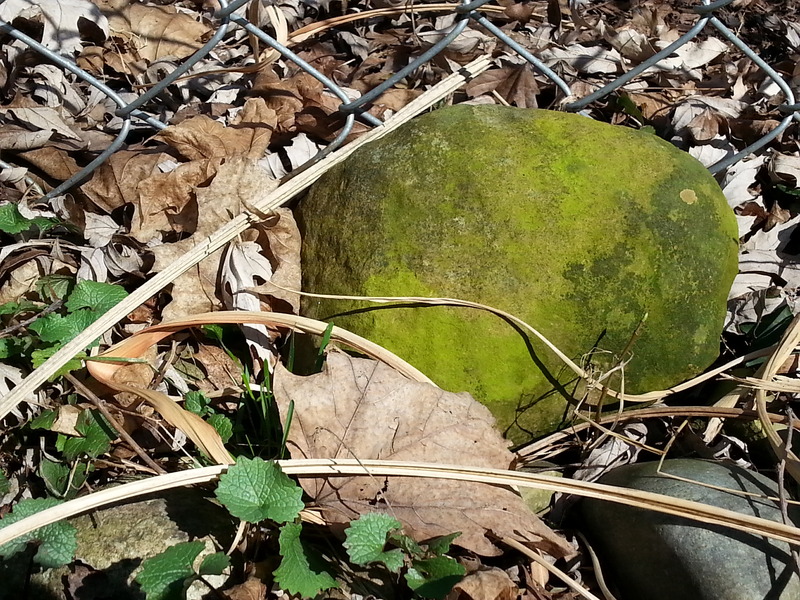 On the home front, I’ve gotten most of my spring yard cleanup done, and uncovered this bright green rock, hiding under a pile of decomposing leaves. So many colors! On top of it all, it snowed here on Earth Day – April 22. Really??? Until happier times return to Chez Campshaw, the blog is going to go dark, so you might not hear from me for awhile. Camp on, if you can…..